Horsham Museum & Art Gallery’s latest exhibition ‘Watercolour RA250’ explores the relationship of leading Royal Academicians with the medium of watercolour. 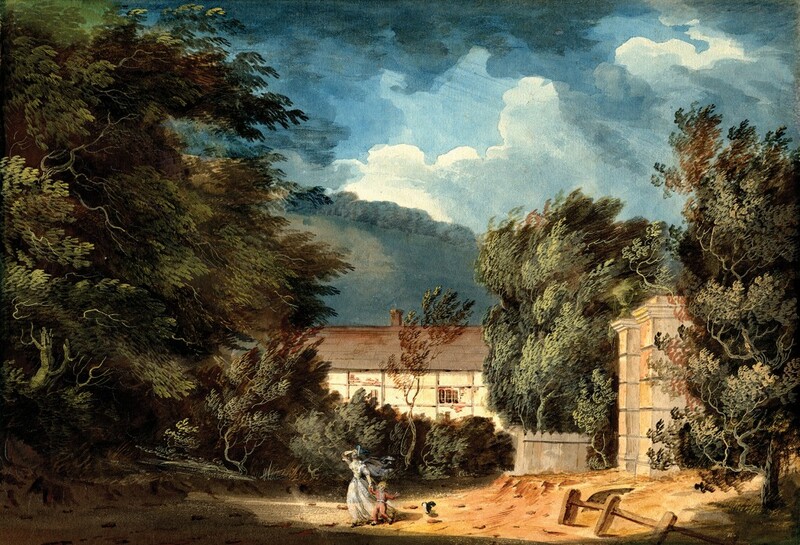 The exhibition was opened by Humphrey Ocean., RA, who acknowledged his connection with Sussex having been born at Hardham. He described how he follows in the footsteps of J.M.W Turner as the Royal Academy’s Professor of Perspective and the importance of Turner’s watercolours in the artist’s oeuvre. The Royal Academy (RA) was founded in 1768 with the approval of George III. Its constitution allowed for painters in oil, sculptors, printmakers and architects to be elected to membership of the RA but not watercolourists. Exhibition Curator Jeremy Knight explained how despite this many leading Royal Academicians over the centuries have been talented watercolourists. ‘Watercolour RA250’ gives a rich insight into these artist’s relationship with the medium of watercolour. Paintings by JMW Turner, Paul Sandby, Humphrey Ocean and many other rarely seen pictures are on show. Works have been borrowed from museums and art galleries across Sussex. 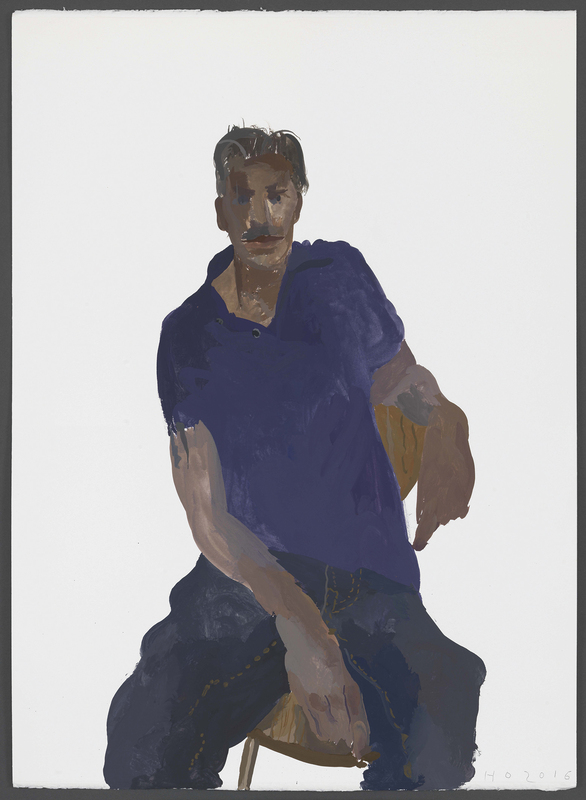 Humphrey Ocean’s work has exhibited at the National Portrait Gallery. 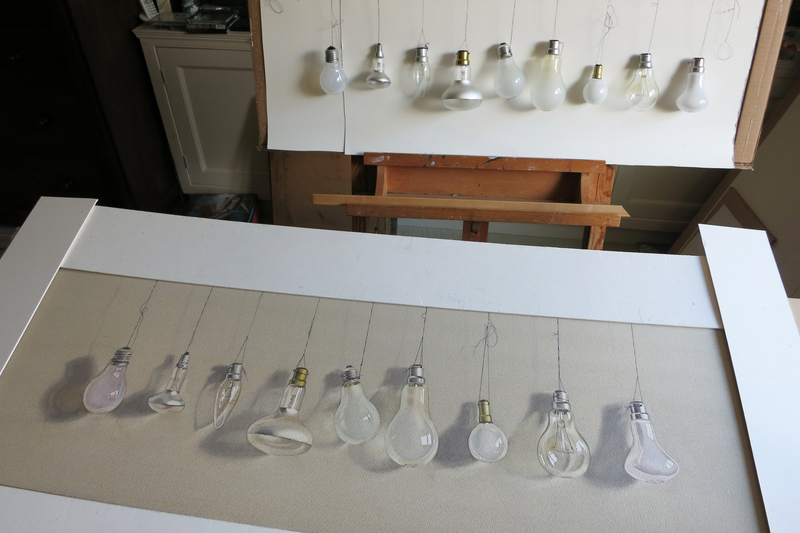 He has been making a series of portraits of visitors to his studio since 2006. He works swiftly employing gouache on large sheets of paper. His sitters are depicted in simple bold forms and colours. These portraits are compelling illustrating the artist’s love of painting, colour and people. Ocean illuminates something unique about each person, their posture and dress, providing an intimate snapshot in time. These qualities are apparent in his striking portrait of the Horsham born artist Mark Alexander. Two important talks will take place at the Capitol, Horsham to accompany the exhibition. On 11th October at 7pm art historian Tom Wilcox will discuss ‘Watercolour in Britain in the 20th century – mainstream or margin?’, and Greg Smith will look at the work of Thomas Girtin on 18th October at 6.30pm. Tickets are available from the Capitol by visiting www.thecapitolhorsham.com. It is exciting to see how Horsham Museum & Art Gallery’s growing collection of watercolours is continuing to raise its profile enabling it to borrow additional major works from museums and art galleries. None of this would be possible without Jeremy Knight and the Horsham District Council’s understanding of the importance of art and heritage to the identity and economy of Horsham and the broader district. 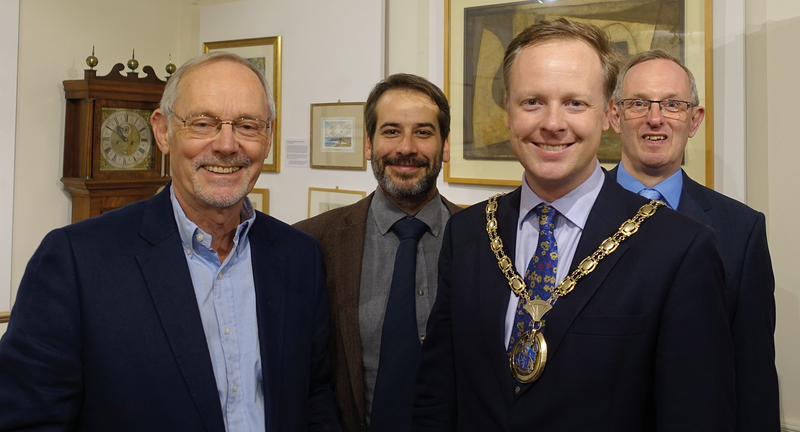 Jonathan Chowen, Horsham District Council Cabinet Member for Arts, Heritage & Leisure, and his team are deserving of our thanks for their continued long term support of the Horsham Museum & Art Gallery. 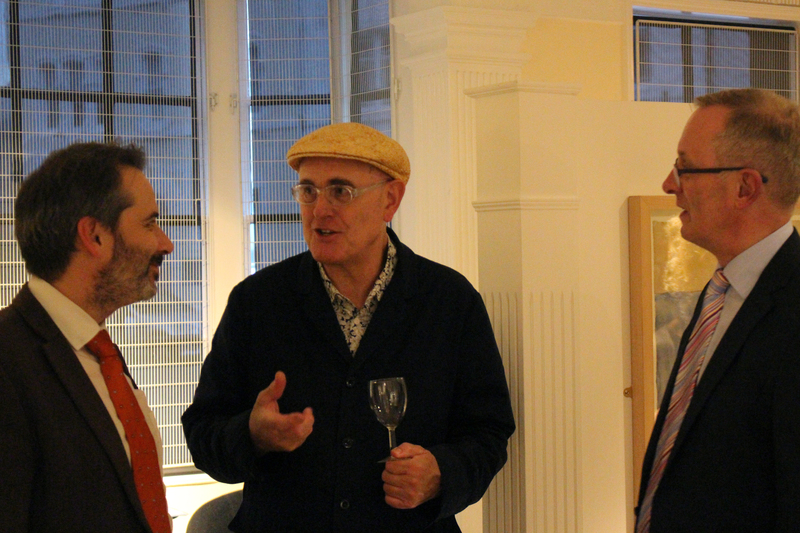 The exhibition is supported by the Royal Academy’s RA250, The Art Fund and Toovey’s Fine Art Auctioneers. ‘Watercolour RA250’ runs until 17 November 2018, at the Horsham Museum & Art Gallery, The Causeway, Horsham, RH12 1HE and admission is free. For more information go visit www.horshammuseum.org. ‘In Pursuit of the Watercolours’ is at the centre of a festival celebrating British watercolour painting at the Horsham Museum and Art Gallery. 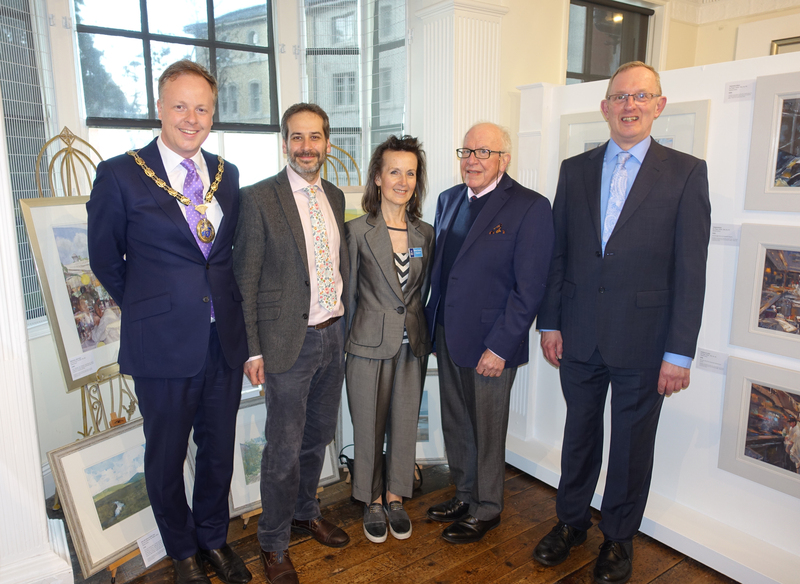 The exhibition was opened by the Tate Gallery’s Lead Curator of British Art to 1900, Alison Smith, in the company of Horsham District Council Chairman, Christian Mitchell and a large gathering of art lovers. 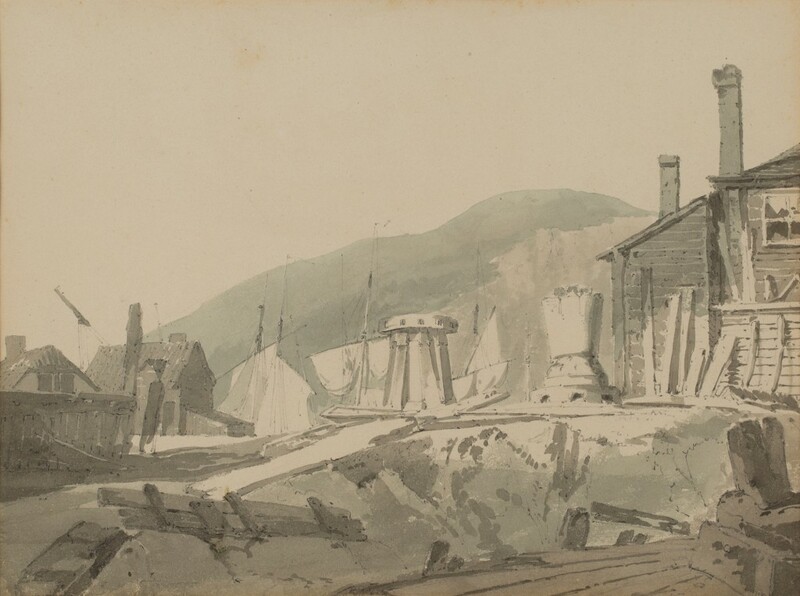 As I reported last week the museum has recently changed its collecting policy and is seeking to collect not only Sussex related art, but also watercolours by the greatest exponents of the medium. It represents a remarkable opportunity to form a collection of national significance. The project will require the continued patronage of The Friends of Horsham Museum, as well as collectors, businesses, trusts and institutions, in order to acquire watercolours. Toovey’s have already donated work. Tate Curator, Alison Smith, expressed her delight to find important watercolourists like J.M.W. Turner, Francis Wheatley, Thomas Rowlandson, John Varley and John Piper represented in an exhibition at Horsham. 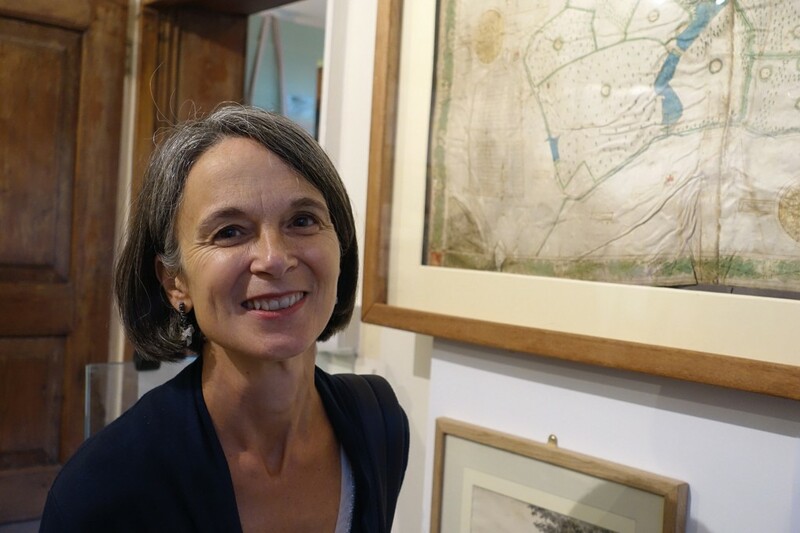 She praised the Horsham District Council (HDC) for its support of the Horsham Museum & Art Gallery, offering particular thanks to HDC Deputy Leader and Cabinet Member for Leisure and Culture, Jonathan Chowen, and Curator, Jeremy Knight. Alison went on to acknowledge the ‘enormous’ contribution made by picture specialist, Nicholas Toovey, to the exhibition and catalogue, as well as Toovey’s Fine Art Auctioneers long term support of the Museum. She concluded by wishing the Horsham Museum & Art Gallery every success in forming its new watercolour collection. The domestic scale and subtle nature of many English watercolours are particularly suited to the British temperament, sensibilities and weather. But watercolour offers artists a depth of colour too. Watercolourists have often recorded the world at home and abroad. During the 19th century there was an increasing interest in the exotic, especially the art, architecture and culture of North Africa, Arabia and the Middle East. Art reflecting these subjects is now known as ‘orientalism’. Dudley Hardy produced many orientalist works and my eye is taken by his watercolour ‘The Bird Fanciers’ which is a prime example of the genre. 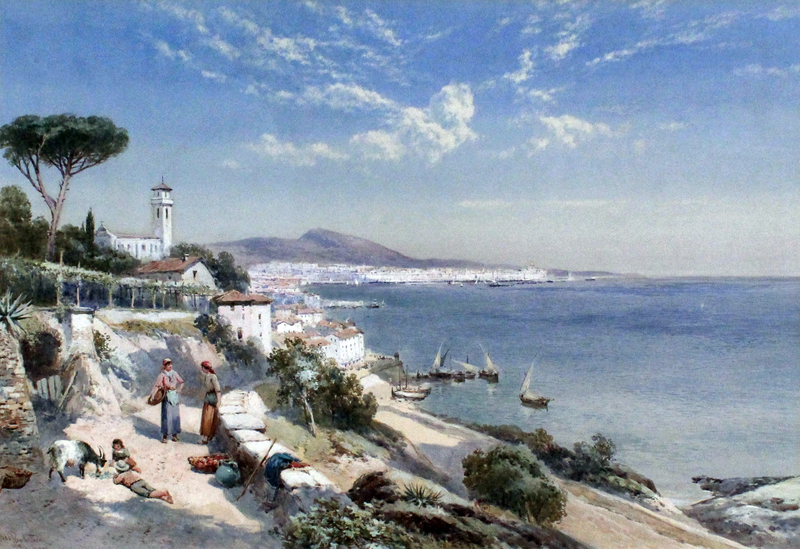 Here Hardy fuses the compositional elements of his father, Thomas Bush Hardy, with the exotic landscape, costume and colours of Algiers. Whilst the exhibition centres on the Golden Age of watercolour painting in Britain in the 18th and early 19th centuries it also has work from the 17th to the 21st century including paintings by leading contemporary watercolourist, Gordon Rushmer. Gordon is holding a series of masterclasses at the museum to support the festival and collection. Toovey’s picture specialist, Nicholas Toovey, will be at The Horsham Museum & Art Gallery, The Causeway, Horsham, RH12 1HE, between 10am and 12noon, this Saturday, 1st October 2016. He will be sharing his passion for the British watercolour and offering free valuations on your pictures. Come and discover whether your watercolour is actually by a famous artist! To support the building of this important new collection of watercolours a third of the seller’s commission for items seen at the event which are subsequently auctioned by Toovey’s will be donated to the Friends of Horsham Museum. Sellers will receive the full amount they would normally get but will know that they have helped the Museum as well. The accompanying catalogue provides a marvellous introduction and insight to the delights of British watercolours. To find out more about ‘In Pursuit of the Watercolour’ exhibition and events in the Horsham Museum & Art Gallery’s Festival of Watercolours go to www.horshammuseum.org or telephone 01403 254959. In 2010 the Horsham Museum became the Horsham Museum & Art Gallery. Visitor numbers have soared, more than doubling in the last six years, making it one of the most visited art and heritage attractions in the South East of England. It is clear that there is an enormous appetite for art in the Horsham District. Responding to this demand the museum has recently changed its collecting policy. 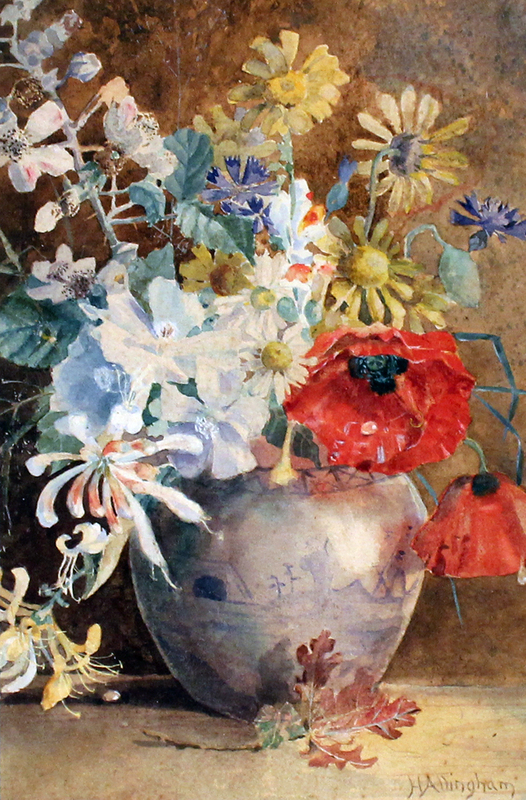 It is seeking to collect not only Sussex related art, but also watercolours by the greatest exponents of the medium. It represents a remarkable opportunity to form a collection of national and international significance, especially as prices for fine watercolours continue to represent exceptional value for money. The project will require the continued patronage of The Friends of Horsham Museum, and the Chasemore fund, as well as collectors, businesses, trusts and institutions, to acquire watercolours. I am delighted that Toovey’s have already donated work. The new collection will allow the Horsham Museum & Art Gallery to borrow major works from national museums, broadening the breadth and quality of its already exciting exhibition program. None of this would be possible without the Horsham District Council’s understanding of the importance of art and heritage to the identity and economy of Horsham and the broader district. Jonathan Chowen, Horsham District Council Cabinet Member for Arts, Heritage & Leisure, and his team are deserving of our thanks for their continued long term support of the Horsham Museum & Art Gallery. ‘In Pursuit of the Watercolour’ is the latest exhibition at the Horsham Museum and Art Gallery. The exhibition celebrates the English pre-eminence in the medium of watercolour painting from the mid-18th century to the present day. The show is predominately formed of rarely seen watercolours from private collectors and ten works from the Worthing Museum and Art Gallery, including a wonderful view of the beach at Dover by J. M. W. Turner. Curated by Jeremy Knight, the exhibition puts a spotlight on the broad range of watercolour painting between the 18th and 21st centuries. The exhibition makes apparent how British watercolour painting moves from the recording of the topographical to a Romantic, personal impression of a particular place. Many argue that the poetic landscape of the romantic imagination is born out of Constable and Turner’s work. J.M.W. Turner would famously break free from the confines of convention and tradition recording impressions of the elemental in nature. The grey wash of his landscape ‘A beach at Dover’, gives a dramatic impression. It is a great treat to observe this rarely seen work. John Claude Nattes’ landscape ‘Horsham on a Windy Day’ reflects something of the Horsham District’s rural identity today. It was acquired for the collection with help from the V & A Purchase Fund and the Friends of Horsham Museum. 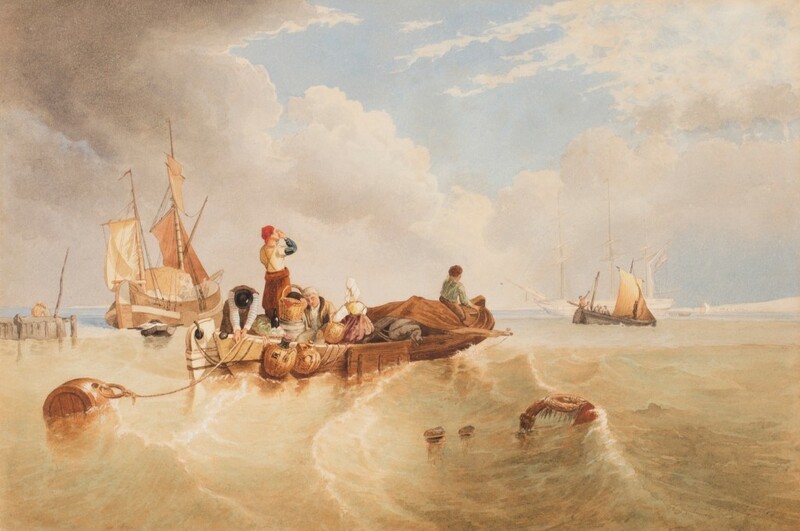 Clarkson Frederick Stanfield’s ‘A Market Boat on the Scheldt’, is a study for an oil painting in the V & A. and has been donated by Toovey’s Auctioneers & Valuers to the Horsham Museum and Art Gallery’s Watercolour Collection. After Turner, Stanfield was considered the greatest marine painter in Britain at the time. John Ruskin preferred Stanfield’s watercolours to his oils as they were more natural and less contrived. He thought him the ‘leader of our English Realists’. I am proud that Toovey’s are sponsoring the exhibition and catalogue ‘In pursuit of the watercolours’. Toovey’s picture specialist, Nicholas Toovey, will be fund raising for the collection between 10am and 12noon on Saturday, 1st October 2016, offering free pre-sale valuations on your watercolours, prints and paintings at the Horsham Museum & Art Gallery, The Causeway, Horsham, RH12 1HE. A third of the seller’s commission for items seen at the event which are subsequently auctioned by Toovey’s will be donated to the Friends of Horsham Museum. Sellers will receive the full amount they would normally get but they will know that they have helped the Museum as well. This exceptional exhibition runs from 24th September to 15th October 2016 and admission is free. Leading English watercolourists from the 18th and 19th Century have seen a revival in prices over recent years. Demand for watercolours by artists like Paul Sandby, Thomas Girtin and John Sell Cotman have followed the trend set by J.M.W. Turner and John Constable. In comparison prices for Victorian artists following in the English watercolour tradition remain accessible providing a rare opportunity for collectors to acquire work of exceptional quality. Watercolours possess a spontaneity and vitality created by the medium. The best Victorian artists applied layered washes without forfeiting the luminous transparency. Colours merge delicately with one another creating a sense of movement and life in the image. Take for example Charles Edmund Rowbotham (1858-1921) who lived for a time at Steyning and Brighton. His watercolour, ‘Near Bramber, Sussex’, was shown at the Royal Society of Artists. He followed in the artistic tradition of his father and grandfather beginning his career by painting figures in his father’s landscapes. Charles Rowbotham married in 1884. He went on a series of sketching tours with his wife in the French Riviera, Switzerland, and Italy. It was during this period that he produced his best work which included watercolours like the scene titled ‘Genoa’ shown here. His penchant for blue with white heightening is apparent in this small jewel like picture. Over the county border in Witley near Godalming, Surrey, the artist Myles Birket Foster (1825-1899) had built a house which was decorated and furnished in the Arts and Crafts taste influenced by his friends Edward Burne Jones and William Morris. Many of the paintings in his home were by Burne Jones, whilst the furnishings came from Morris and Co. Birket Foster painted romanticised views of the English countryside particularly in Surrey. Before coming to Surrey he had toured widely including Italy. 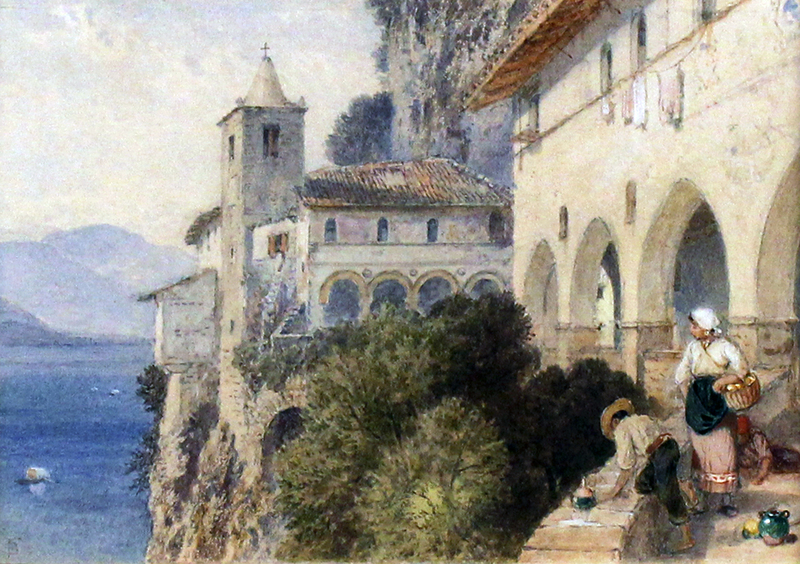 The watercolour, ‘Catalina, Lake Maggiore’, shown here shows the delicacy and detail of Birket Foster’s work. Helen Allingham (1848-1926), another Surrey artist, painted the beautiful still life. As a watercolourist she became famous for her depictions of figures, gardens and cottages in an articulation of the rural idyll. Still life studies were often painted by women artists at this date, though not commonly by Allingham. There is a vitality in her depiction of the vase and flowers which appears contemporary to our eyes. Values at auction for pictures like these range from high hundreds into the low thousands. All these pictures have recently been sold in Toovey’s select paintings auctions at their Washington salerooms. 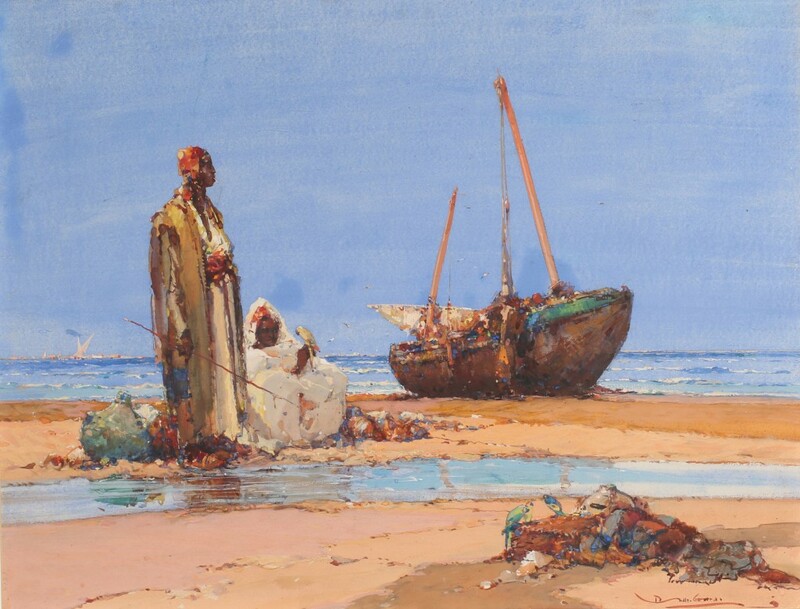 If you are considering the sale of your pictures, or are keen to collect, contact Toovey’s Fine Art specialist, Nicholas Toovey, for advice by telephoning 01903 891955 or email auctions@tooveys.com.